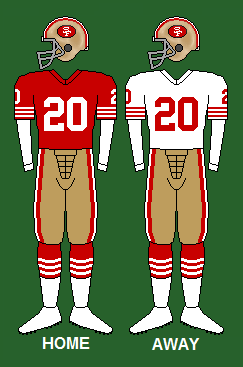 The San Francisco 49ers 1988 season was their 43rd season in the National Football League. The season was highlighted by their third Super Bowl victory. In 1988, the 49ers struggled. At one point, they were 6–5 and in danger of missing the playoffs but rose to defeat the Washington Redskins on a Monday night, eventually finishing the season at 10–6. They gained a measure of revenge by thrashing the Minnesota Vikings 34–9 in the first round. The 49ers then traveled to Chicago's Soldier Field, where the chill factor at gametime was 26 degrees below zero. They defeated the Chicago Bears 28–3 in the NFC Championship. The 1988 San Francisco 49ers season held training camp at Sierra College in Rocklin, California. In the 1988 season, San Francisco won the NFC West with a 10–6 regular season record, but it was a long uphill battle; the Niners, Rams, and Saints all finished 10–6 with the Niners winning the division on tiebreakers. The team had a quarterback controversy with Montana and Steve Young each starting at quarterback during the season. But after a 6–5 start, Montana led the 49ers to win 4 of their final 5 regular season games. Montana finished the regular season with 238 completions for 2,981 yards and 18 touchdowns, and also added 132 rushing yards. His favorite target was Rice, who recorded 64 receptions for 1,306 yards (a 20.4 yards per catch average) and 9 touchdowns. Craig was also a key contributor with a total of 2,036 combined rushing and receiving yards and 10 touchdowns, earning him the NFL Offensive Player of the Year Award. Fullback Tom Rathman also made a big impact, rushing for 427 yards and catching 42 passes for 387 yards. The 49ers defense was led by defensive backs Ronnie Lott, Eric Wright, Jeff Fuller, and Tim McKyer, who recorded a combined total of 18 interceptions. McKyer led the team with 7, while Lott recorded 5. Linebacker Charles Haley was also a big contributor with 11.5 sacks and 2 fumble recoveries. b Simulcast on KTVU-TV in San Francisco, California. The Saints, fresh off the first winning season in franchise history, clawed to a 17–10 halftime lead in the second quarter, but Joe Montana erupted in the third with three touchdown throws. Coach Bill Walsh, wanting to get playing time for backup Steve Young, put Young in for the fourth quarter; Young was sacked in the endzone for a safety and the Saints scored seven more points after that, nonetheless coming up short 34–33 to the 49ers. Concerned over Montana's health, coach Walsh started Steve Young in his place against the Giants; Young's rawness to the Niners offensive system showed in he was limited to 115 yards passing and the Niners trailed 17–13 in the fourth. Montana came in and fired a 77-yard touchdown in the final minutes to Jerry Rice and a 20–17 Niners win. The 49ers lost to the Falcons for only the fourth time since 1981 as Joe Montana was intercepted three times and sacked three times in a 34–17 rout. Gerald Riggs of the Falcons rushed for 115 yards and a touchdown. The Niners rebounded by putting up 580 yards of offense in a 38–7 rout of the Seahawks. Joe Montana threw four touchdowns and Steve Young added a fifth while Roger Craig and Tom Rathman accounted for 186 rushing yards. The Seahawks Jeff Kemp was intercepted three times and Kelly Stouffer added a fourth pick. Joe Montana threw for 191 yards and an interception; he was replaced by Young as John Elway tied the game 13–13 on a touchdown to Vance Johnson. Wind gusts up to 40 MPH suddenly hit Candlestick Park and made passing more difficult; in the overtime a Steve Young pass was intercepted, setting up Rich Karlis' winning field goal (16–13 final for the Broncos). Roger Craig had one of his greatest games in a 199-yard stampede where he scored three touchdowns, highlighted by a dramatic 46-yard score in the first quarter. Despite three Jim Everett touchdowns the Rams fell to San Francisco 24–21, the tenth 49ers win in the rivalry's previous 14 games. The Niners struggled to a 10–9 loss to the Bears on Monday Night Football. The Niners incurred ten penalties for 57 yards and Joe Montana was sacked four times. The Vikings' playoff win at San Francisco the previous season hung over Candlestick Park as Coach Walsh started Steve Young in Joe Montana's stead. Young struggled and was booed repeatedly by the crowd ("They were running him out of town", lineman Harris Barton said). Just before the two-minute warning in the fourth quarter the Vikings led 21–17 with the Niners at Minnesota's 49-yard line; Young escaped a sack and ran in the game-winning touchdown, earning applause from the same audience that had been booing him; the NFL Films clip with Lon Simmons' call of the score is among the most replayed in retrospectives on Young's career. With Young still starting, the 49ers raced to a 23–0 lead in the third quarter, and Coach Bill Walsh felt it was the sharpest the offense had looked all season. The Cardinals, however, began clawing back as Neil Lomax rifled a pair of touchdowns; making matters worse for San Francisco was a whopping 14 penalties for 106 yards. On a kick return Walsh was blindsided by a runner and suffered two cracked ribs; he then had to watch as the Cardinals raced down field in the final minute and scored on a nine-yard Lomax score to Roy Green. It turned out to be the last road loss for the 49ers until Week One of the 1991 season. The refocused Niners erupted on the defending champion Redskins, racing to a 23–7 halftime lead and winning 37–21. Joe Montana threw two touchdowns (including an 80-yarder to Jerry Rice) and ran in a third. Super Bowl MVP Doug Williams of the Redskins threw three touchdowns while Timmy Smith was held to just six rushing yards. The Niners' scoring explosion continued at Jack Murphy Stadium as Joe Montana threw three touchdowns (the first a 96-yarder to Jerry Rice) and Roger Craig had two rushing scores and a touchdown catch, while Doug DuBose added a rushing score. Four Niners backs plus both quarterbacks (Montana and Steve Young) rushed for 203 yards crushing the Chargers 48-10. The Niners traveled to Fulton County Stadium and limited the Atlanta Falcons to 177 yards of offense in a 13–3 win. The Niners hosted the Saints with both teams at 9–5. Led by Roger Craig's 115 yards, the Niners rushed for 152 yards and two scores while Joe Montana threw for 233 yards and a score in San Francisco's 30–17 win. The Niners clinched the NFC West despite a three-way tie with the Rams and New Orleans (all finishing 10–6) and despite a 38–16 slaughter by the Rams that put them into the playoffs. Jim Everett threw four touchdowns while Montana and Young combined for 291 yards but no scores. San Francisco won the division on tiebreakers and the Rams were the wild card, while the 10–6 Saints were eliminated from playoff contention. For the third time in some 365 days the 49ers hosted the Vikings, and for the second time in that span it was in the playoffs. Minnesota entered having shot down the Rams 28-17 and boasting an offense fourth in scoring with a defense second in fewest points allowed with a plus-23 turnover differential – and none of it made any difference as Joe Montana threw three touchdowns in the first half and Jerry Rice caught all three. Wade Wilson was picked off twice as the Niners won 34-9, their first playoff win since Super Bowl XIX. The Niners traveled to frigid Soldier Field a week after the Bears succeeded in the Fog Bowl against the Eagles and less than three months after San Francisco's ugly Monday Night loss in that same venue. The Niners put the game away in the third quarter following Joe Montana's third touchdown of the game as the Niners limited the Bears' sluggish offense (18th in scoring) to just one Kevin Butler field goal. The win was doubly personal for Walsh between returning to the Super Bowl and also quieting hecklers in the Soldier Field crowd, including one in particular who'd persisted in what Walsh delicately described as "remarks about my body parts and my preferences in life", but who was reduced to futile stuttering as the game got out of hand. The game is remembered for the 49ers' fourth-quarter game-winning drive. Down 16–13, San Francisco got the ball on their own eight-yard line with 3:10 on the clock and marched 92 yards down the field in under three minutes. They then scored the winning touchdown on a Joe Montana pass to John Taylor with just 34 seconds left in the game. 49ers wide receiver Jerry Rice was named the Super Bowl MVP. He caught 11 passes for a Super Bowl record 215 yards and one touchdown, while also rushing once for 5 yards. This was also the final NFL game coached by the 49ers' Bill Walsh. This was also the final Super Bowl that Pete Rozelle presided over as NFL Commissioner. ↑ "1988 San Francisco 49ers starters and roster". Pro-Football-Reference.com. Retrieved March 1, 2015. 1 2 3 4 5 6 7 8 9 10 11 12 13 14 15 16 17 San Francisco 49ers 2015 Media Guide. San Francisco 49ers. p. 455.